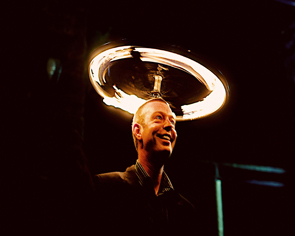 Our fire performers have been creating breathtaking fire shows for over ten years. 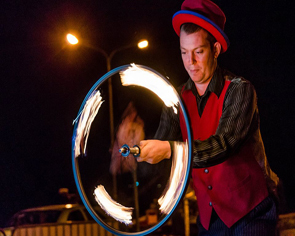 Using circus and theatre skills combined with original soundtracks, cutting edge fire props and acrobatics we create spectacular fire shows that will leave audiences mesmerized. We can provide from a single performer to numerous performers and acrobats to create large scale spectacles. 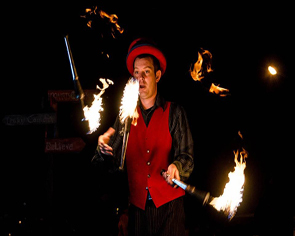 Our fire performers will help you turn your occasion into something special and unforgettable. We choreograph each performance and go beyond the usual fire spinning by including circus techniques such as fire juggling, fire fans, fire hoola hoops, fire costume and our unique fire wheels that we have never seen anyone else use anywhere. 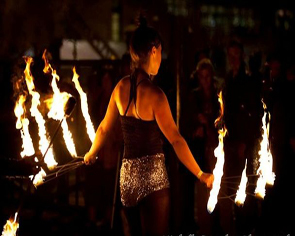 We can also add acrobats that perform fire limbo to the mix, add special effects to create sparks that fly and for very large scale shows we use sparkle poi to create massive sparks and flaming trails. 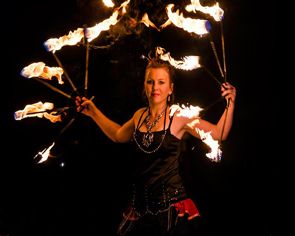 All our fire performers are highly experienced and fully insured. Our performers are ideal for festivals, corporate events, photo calls, brand promotions, weddings, fun days and other special occasions. Give us a call today to see how we can enhance your special event.